Worcester has seven pubs in the Good Beer Guide, so it's going to be a bonzer place beer wise for a wander round isn't it? Well, not on this showing actually. Firstly we didn't encounter a single beer in what you'd describe as tip top condition. Most were sort of OK, but lacked that sure touch of cellarmanship that marks out really good cask ale. First up was the Plough, where Purity Gold was the beer of choice. Now this is a splendid beer, but here it was ordinary. The Postal Order,one of the better JDWs, had only Ruddles on offer, as they were getting ready or the Beer Festival. OK tomorrow there would have been brewers and CAMRA talking about beer, tastings and plenty of choice, but the night before? Nothing. We decided that it just wasn't our night and went to the Dragon Inn having had a pint in another GBG pub, whose name, even after checking the GBG, escapes me. (It might have been The Swan?). It was that sort of night. The Dragon Inn wasn't a bad pub, though hardly the friendliest ever and the beers were decidedly ordinary presentation wise, though no complaints about choice, with Millstone, Cannon Royal and Little Ale Cart Bailie Nichol Jarvie. This beer, named after the locomotive, not the whisky, was hoppy and bitter, but sort of died in the glass. Others did enjoy the Millstone, but this to us, was coals to Newcastle. We bailed out to Abdul's Curry House. This was a class act which everyone enjoyed. My nargis kebab starter was interesting and I'd have it again. We walked back to our digs, fu' as puggies from the food,* despite the moaning of one of our party about taxis. OK he has just had a knee replacement, but taxis for a couple of miles? Our CAMRA Branch has a trip to North Yorkshire on Saturday and Sunday. 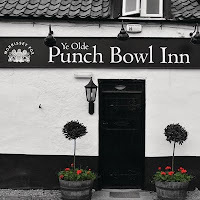 We were due to visit the Punch Bowl Inn, owned by the Morrissey/Fox team and featured on Channel 4, but our Dear Leader tells me it is closed. Somehow I have missed this, but it seems the dynamic duo have handed the keys back in. First the on site brewery went and then the pub. There is some interesting stuff on it in The Publican, but it seems all was not sweetness and light with the locals who felt excluded. Seems too MF are now looking for other free houses in the Yorkshire area. Maybe they'll have learned enough lessons to make it work next time! The Wembley Weekend (see below) is always chosen carefully to maximise the potential of finding decent beer in a variety of good pubs. It doesn't always work out that way, such are the vagaries of cask ale, differing tastes and the quality or otherwise of the local beers we encounter. Worcester and Bewdley looked promising though. Our first stop - and don't worry this isn't going to be a list of pubs, but a recall of highs and lows - was the excellent little Black Country local, the Bull's Head in Sedgeley. Bustling and busy on a Tuesday lunchtime, the welcome was warm as we exchanged banter with the locals, trying very hard to follow a dialect that was a thick as the crusty cobs we ate. We enjoyed the place a lot and listened to the tale of the local Wetherspoon's being firebombed earlier in the week, with some amazement. (The Bull's Head is opening at 9 a.m, to compensate the thirsty.) Holden's Mild was a dark delight, though the bitter is too sweet for my taste. The Golden Glow and the Dragon's Blood were both deliciously hoppy and balanced, with the Dragon's Blood being surprisingly pale, though I am sure no-one really knows a dragon's blood's true colour. Three and a half pints of mild plus four giant cobs - see photo - were just over a tenner. Value and then some. Surprisingly our next call, the classic Beacon Hotel, home of Sarah Hughes beers and an old friend to us, was poor. Again busy for a Tuesday lunchtime, the beer was on a low, with the Amber tasting infected and the famous Sarah Hughes Dark being nearly as bad. We struggled through our beer and beat a hasty retreat. A great pub though and surely just an off day? Our final pre - Worcester call was another great pub which didn't disappoint. The Waggon and Horses in Halesowen is a corner street local with fourteen handpumps, foreign beers galore on the bar, four cask ciders, as well as a carefully chosen list of foreign bottles. What's not to like? The two young lads serving us were enthusiastic, knowledgeable and had obvious pride in what they were doing. They were helpful without being patronising and talked us through what they had on sale and what was on particularly good form. Beers from Nottingham, Oakham and White Lion didn't disappoint. Real Black Country pork scratchings were a perfect if tooth jarring accompaniment. We left with reluctance. Next was Worcester where the picture changed. For the worse unfortunately. The giant cobs, filled and I mean filled, with good quality cheddar or ham were £1.20 each! Once a year I go off for a few beers with three other mates. I won't bore you with the details of why, but it is known as the Wembley Weekend, though we don't go to Wembley, and now we're all retired, it isn't a weekend. So Worcester and Bewdley, here I come. There seems to be some terrific pubs in those areas, so it should be good. Watch out for the odd tweet. I'll mention beery highlights on my return. PS. I'm the youngest. Not often I can say that these days. We lost a couple of our Sunday regulars at the pub yesterday. Dave and Gwen who have been going there each Sunday, more or less, for the last twenty years, have decided to move to Wensleydale, where Gwen originates and where she still has relatives. They maintain a caravan there, so it's familiar to them. So there was a little celebration yesterday. The Sunday regulars were out in force including a few old faces, returning for the occasion. Sandwiches were provided by the landlady and a framed print of the pub, signed by all the Sunday crew, was presented by me, on behalf of the regulars, to Dave and Gwen. It was an honour to be asked to do so and to say a few words on behalf of everyone. Of course I recalled old times and faces, I mentioned that the pub just won't be the same without them, as it is the comforting familiarity of seeing the same faces, of passing a few words at the bar with each other, of the ease with which we can talk of this and that in our cosy little world, that makes it such a good place to spend a Sunday. You really can forget your cares for a while. Dave replied, saying that truly, the thought of leaving the THT behind was a major factor in deciding whether or not to move. He said that it had been hard to think of times without the company of all their friends at the pub. It had been a close call. He went on to praise the unique nature of our pub and to thank everyone for the happy times they had spent there. It was an emotional occasion. We were saying goodbye to two of our own. We all felt a sense of loss. When you hear so much negativity about the pub trade, it is good to remember that there are thousands of decent pubs, with splendid regulars, whose lives are enhanced by their pub visits and by the people they meet there. I feel lucky and privileged to be one of them. I am sure that Dave and Gwen will find a new pub to go to and that they'll settle in to their new lives well, but I know that from time to time, they'll think of their old friends in our pub and we'll look over to their usual corner and picture them there. When E and I left, much later than we intended, Gwen and Dave were still there, with some of their usual crew, having a last one for the road. I hope the picture got back down the lane safely! Pictured are Dave, Gwen and the Landlady (centre). I've been following the Brew Dog "share float" stuff with great interest and not a little incomprehension. I haven't coughed up £230 for what seems to be a chimera; no not the fire eating monster, or the antibody, but the "fanciful mental illusion or fabrication." There is much to admire about Brew Dog. The cocking of snooks at the authorities, the viral advertising, the excellent attitude to beer and what it should be like and most importantly what it shouldn't be like and, of course, their cutting edge beers. And they are Scottish; not from the posh part of Edinburgh, or Glasgow wide boys, but from Fraserburgh for God's sake. What's not to like? Nothing of course. What is ground breaking, (some may say odd) is the way they are using their viral advertising to lure supporters in to buy their share issue, "Equity for Punks". It is clever, it is interesting, it isn't sold as an investment, more a sort of "give us some money now and we'll be nice to you and maybe give it back to you sometime in an unspecified future" kind of way. It is open, it doesn't make false promises and all is therefore well. Or is it? The reaction of some bloggers and followers of blogs is along the lines of mass - well not mass - maybe "selective" would be better - hysteria. Sort of "You are nice guys, I love your beer, here's my money". It is either noble or foolhardy, but maybe tilting at windmills in such cynical times isn't such a bad thing, though it seems to this writer that these shy Scots have the chutzpah of Del Boy. In an unassuming way of course. Has anyone asked the obvious question which is " Why does the brewery need to be ten times bigger? Will that make the beer better? Will it increase innovation? I have an analogy. Anyone remember Pete's Wicked Ale? 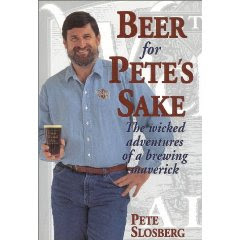 Pete Slosberg was the Brew Dog of his day in the US. He broke moulds, he innovated, he became the second biggest craft brewer in the US, then in 1998 he sold the lot to the giant Gambrinus Company who make his beer in a non innovative way, in whatever brewery they care to. I dare say its still pretty good beer, but you take my point. It isn't innovative or cutting edge anymore. It is though big and Pete has presumably got lots of money out of it. Not that this need apply to Brew Dog of course, but I'm just saying, that's all. Strangely though even I'm slightly infected. There is a tiny bit of me that wants to chip in too. Seems I've also been touched by the virus, but I'll resist. Much is made by Brew Dog of their new shareholders, but I've never heard of Skyy Vodka and if they've got a billion from selling it..............? PubCos Off the Hook - For Now. The Office of Fair Trading has ruled out action against the PubCos on the grounds that their current activities and the tie they impose, doesn't act against consumer interests.. They said it had "not found evidence that supply ties are resulting in competition problems that are having an adverse impact on consumers". CAMRA, who had raised the complaint expressed disappointment, but will ask the Government to take action following the scathing Business and Enterprise Committee Report. There is more than one way to skin this cat it seems. While disappointing, this is hardly surprising, given the narrow remit of the OFT, though it could well be argued that the effect on consumers is somewhat more oblique than stated by both CAMRA and the OFT. Reading the report, it seems to me the OFT has been a bit keen to get this one done, dusted and forgotten. The Morning Advertiser has the story and you can download the report which is quite interesting. Breaking News: The BEC will re-convene before Christmas to consider its position. Hooray. Despite the crashing pound, me and E are going on a day trip to Brussels in mid November, courtesy of the Sunday Times "Two for £90" offer. We get there at ten and leave at eight thirty in the evening, so it's a fair old day out. That's the beauty of having a London place, we can get these little pleasures more easily and in fact, we'll make a saving, more or less, or at least beak even on the deal, as we won't have to pay that grinning, bearded git Branson anything for Eileen's immensely expensive journey to Manchester and back. It's a little while since I've been to Belgium and even longer since Brussels, so of course the question to ask, is what I shouldn't miss pub wise. I really want to visit Oud Moeder Lambic which I know is a tram journey away, but otherwise I'm open to suggestions, though they must be easily reachable from the centre on foot. I read in The Publican that SABMiller saw its UK beer volumes rise by 15% in the first six months of the year. The article goes on to say that lager volumes fell by 1%, but gives no clue as to how the overall rise in volumes is derived. Well one might conclude that this rise is ale volumes, as they don't brew stout, but can that really be true? To me this just doesn't add up. Footnote: A look at SABMiller's trading statement leaves me none the wiser, except to conclude that the Publican is mixing up world and UK positions. I have just returned from a night out at the Rain Bar, hosted by JW Lees our local brewer. The idea was to put beer up against wine in a foody menu.The event was compered on the beer side by Garrett Oliver, Brewmaster of Brooklyn Brewery, New York and a local wine guru, flying the wine flag. Beer won, unsurprisingly given the fact that almost all the guests were beer buffs of some sort. The menu was superb and the concept interesting. All in all a very informative and for me, different night and it was nice to get an invite. I left full of food, wine and beer at midnight and stumbled into a taxi. Radio 4 was just finishing as I got into bed, hence the title of this posting! I've just read Woolpack Dave's latest post on the above subject. It's a good post with a lot of sensible things said, particularly when he says "But I'm a beer writer, I can't say these things. 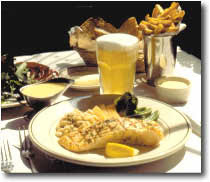 Surely fine dining food must be able to match with beer?" He goes on to say "We need to think in the same way as the sommelier in a great restaurant. We need to think about what is bold enough to stand up to great food, what can match and compliment to provide an integrated experience. Without this approach we are still going to find a great gulf between the beer and restaurant trade.". Now you might well say as I first thought, "This is pretty obvious and none the less true for that". But the more I thought about it, the less convinced I became. In a fine dining experience, I rather fancy that most experienced fine diners know the sort of wine they like to accompany food, whether or not that wine is actually the best match. I also rather fancy that most do not rely on the sommelier for advice. I certainly wouldn't. I don't have an unlimited budget and wouldn't want to be a hostage to fortune, nor be embarrassing myself by whispering. "only up to £25" ( or whatever) when seeking advice. I suspect reliance on sommelier advice is a very top end trait only. When we extrapolate that situation to beer, it becomes more complex still. At least in a fine dining restaurant, you can be reasonably sure the wine list is well chosen and the descriptions accurate. It isn't then that difficult to make an informed choice. When you substitute beer for wine, the matter becomes rather more complicated, as the list isn't so likely to be so well chosen - the expertise just doesn't exist in the restaurant trade and frankly, those who like beer with fine dining meals, are likely to jib at someone else's choice. There are many other factors too, that to my mind militate against it, not least of all lack of serious demand. But that needn't be the end of it. Moving back down the scale, to pub, bistro or home dining, things become easier. A nice stout might sit well with a steak pie. Or an IPA just might cut through a curry and a good crisp, well made pilsner would suit most roast pork dishes very well. One will have one's own preferences, but at that end of things, you can afford to experiment. You can't really at the other. There to me is the difficulty. You would need a level of expertise at the selling end, together with a willingness to experiment and pay through the nose at the buying end, for this to work on any grand scale, which it really won't. This bird is not going to fly, though individual restaurants could make it work to a limited extent and at least offer choice. Now, paraphrasing Dave, I'm a beer writer too and would like to see more availability on restaurant menus of beers that generically go with food; say a decent wheat beer, a top class, stout, a spicy Belgian, a proper pilsner, a hoppy and bitter IPA and a strong barley wine. The list isn't exhaustive, but it would be a good start. Regretfully not all will be British - the diversity just doesn't exist at the top end. Beer is a long way behind wine, we need to walk before we can run, but we do need to push this. Many beers are indeed a fine accompaniment to food and in his penultimate paragraph, Dave suggests a way forward. It is a good one. Finally on a further note of agreement, barley wine and good cheese - there's a splendid match. Photo nicked from Garrett Oliver's site, but that's OK. See next post which is reproduced from my personal blog, dated 02/10/2007. He gets a nice mention there. I've just watched Channel 4's "The Red Lion", a documentary look at pub life seen through a number of different pubs each called the Red Lion. It was non judgemental, sympathetic and if this doesn't sound too contradictory, warts and all. From binging student girls, to elderly men seeking companionship, to rugby teams, old ladies and a permanently tipsy landlord, the pub all meant something more than just a drink. It was companionship and good times, though not without a little pathos. It was excellent viewing for the fervent pub goer and a timely reminder in its final Red Lion, of what the closing of its only pub can do to a village community. My mate Graham suggests a few pints later - we haven't been out for a while with one thing and another. Shall we meet in Manchester and do the usual rounds? Boring old places like Micro Bar, The Angel, The Marble Arch and maybe even nip over to the other side of town for a change, to Knott Bar, The Lass o' Gowrie or Kro Bar? No. We're off to sample the beery delights of Rochdale. It's good enough to compete in so many ways, with quality beer and pubs abounding. And it'll make a change. That's the thing about living in a relative beer nirvana. You are spoilt for choice. Graham with his Mum amd Dad in a famous German pub. After dropping Eileen off at the station this morning, I arrived home just after seven on a glorious morning. The air was fairly still, but I got a distinct whiff of Middleton's other commercial brewery - the one that isn't Lees. Anyone know its name? As usual in any competition I run, there will be no prizes whatever, but I'll be impressed with you. Isn't that enough? Oh and I'm excluding Tyson from this. He probably knows what it is. I had the chance to compare three widely spoken about beers last week, though not all at the same time. First was Marble Dobber which I have already mentioned was voted Champion Beer of Greater Manchester last Friday. This is a terrific beer for the hophead. It is intensely, resinously, bitter, but by no means one dimensionally so. I guess it has a progressive and complex hopping regime. 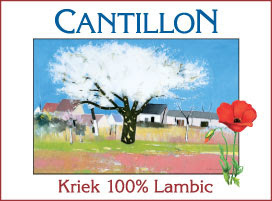 given that it grows in hoppiness throughout, to a lip smackingly resinous and lasting finish. It drinks all too easily for its 5.9% strength and deserves the often used, but easily understandable descriptor, "dangerously drinkable". I was advised in advance the the Waterhouse had Jaipur IPA - also 5.9%, coming on, as one of my co-workers at MFDF had supplied a pumpclip for it. I took Eileen with me on Saturday and after fighting our way through good natured cider and lager drinking Rugby League fans from Leeds and St Helens, in town for the big match, a pint and a half was procured. As always this beer wasn't clear. I have come to the conclusion that this must be deliberate. I have never had a clear pint of it, not even at Thornbridge Hall. "You don't drink with your eyes" I hear some cry. Well, effectively you do. Appearance is most certainly part of a beer's appeal - ask anyone who has judged beer - and to me this just doesn't look the part. I have to say it didn't live up to its hype and again, with the exception of a few good pints, to me it rarely does. Sure it had bitterness, but this fought against the sheer underlying sweetness of the beer. There was some citrus from the C hops, but overall it underwhelmed. The finish was sweet too and faded almost immediately. A new discovery for me is the M&B run Wellington, which along with its companion pub, Sam Smith's Sinclair's Oyster Bar, has peripatetically shuffled round Manchester City Centre. I say new, as I haven't been in it since its second move from Shambles Square. A tip from a fellow CAMRA member took me in there in Thursday. I was impressed by the beer quality, so took the discerning E for a visit. 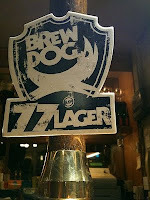 On the bar was the 4.9% Brew Dog 77 Lager. It had to be ordered, as I see cask Brew Dog all too rarely. Firstly it was a much darker beer than I expected. It was well conditioned, full bodied and rather malty with developing bitterness, through to a decent bitter finish. It didn't seem to me to have many lager characteristics at all and I wonder if there are slightly - or even completely - different versions brewed for cask and bottle? So conclusions? Well none of this is scientific, but my feeling is that in their quiet understated way, Marble are producing spectacularly good beers and while keeping a low profile, are going from strength to strength. That's fine as it's local to me. The others? Well, on this showing, Jaipur didn't come out too well, but so many people rate it so highly, I keep trying it whenever I see it, in the hope of being converted. I'd like to try another somewhere else, as I would with Brew Dog, though I have to say the 77 was very drinkable. Let's see more of their cask in the North West please. In cask I have rarely been disappointed with their beers. Disgracefully Sinclair's has had cask removed and I bet they sold more than an eighteen a day. Is Sam's becoming more or less a totally keg brewery? If so, a pity, as they have some really fine pubs. Marble Dobber of course. Of course? Well the panel I chaired put this through as our best beer by a fair old way. I was confident it would win and it did. Pale, bitter, hoppy, complex and at 5.9%, no pushover, it had a lot going for it. Beer writer and top blogger Pete Brown was on the final panel. I had a couple of chats to him. He looked tired after all his booky events, but the book is selling well. I promised I'd buy one. Second was Silver Tally from Prospect Brewery of Wigan and third was Special, a strong dark mild, from Green Mill of Rochdale. Readers of this blog will know that I think the pub industry needs to up its collective game in terms of how they treat their customers. Seems a lot of customers agree with me. Retail Eyes surveyed 6,523 consumers on which sector delivers the best customer service — just 6% said the pub and bar sector delivered good service. Let's think about that for a moment. Six percent. It isn't good is it? The reasons given are so simple, obvious and easily corrected, it makes you annoyed just to think about it. Customers (oddly enough) disliked dirty and uncleared tables. They resented waiting too long at the bar and staff who were disinterested, or didn't engage with them. No less than 56% have walked out without buying anything because of this type of thing, losing pubs business immediately and no doubt for the long term. One publican commenting (fairly alone among those who blamed lack of support from PubCos, low wages, better prospects elsewhere and the smoking ban!! )said, wisely I think, "It costs nothing to smile and be attentive. A good pub will have staff smiling, and importantly looking at the customers, registering they know who is next. I've been in the trade for forty years, and if there is one thing I still find irritating it's the lack of customer care, having said that, it comes from the top, no such thing as bad staff, it's bad managers. It hurts but the survey is very accurate." Time for houses to be put in order I'd say. We had our six weekly CAMRA Committee meeting last night in Sam Smith's Yew Tree near Rochdale. It has the advantage of being reasonably central and has a guaranteed private room. It also has cask Old Brewery Bitter or, rather, did. When I got there, three of my colleagues were already there. I sensed something was up. "It's gone keg" says one. Damn. A well dressed and very posh gentleman was on his mobile at the bar. He had a large list in front of him and was asking each recipient of his calls in turn, in the plummiest of tones, "Do you have a spare microwave?" He preceded this by announcing "Humphrey Smith, Area Manager here". 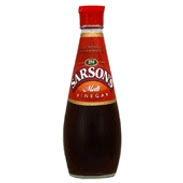 I whispered to my friends, "This is the top man - this is Mr Humphrey, the controlling owner of Sam's". We determined to beard him in his den. When he got off the phone, introductions were made. "Why had the cask been removed?" "Head Brewer says you need to sell an 18 a day otherwise the beer sours in wood." quoth he gruffly. "Why not do metal nines then?". "This is a traditional brewery" says the oracle. "Our cask beer comes in wood." One of our number continued the conversation as he went out to his car, a very modest X reg Rover 75. Apart from a sideswipe about Lees, he got no further. Mr Humphrey had left the building. We had a quiet word with the landlady after his departure. Was he really the Area Manager? Yes. He had taken over when the last one left, to save money it seems. Now Sam's are known for their eccentricity. It comes from the top as Mr H rules the roost. What he says, goes, odd or not. You also now know the criteria for getting cask in your local Sam's pub. Flog an eighteen a day! He presumably wanted the microwave for re-heating" the pre-prepared meals, from the company they recently bought. They introduced standard menus and chucked out all home cooked food, though I believe in some cases, this has been moderated. On about the third time of trying to arrange it, the very nice Wikio Blog Rating people and me have finally managed to sort out me hosting the latest blog rankings for the Wine and Beer category. 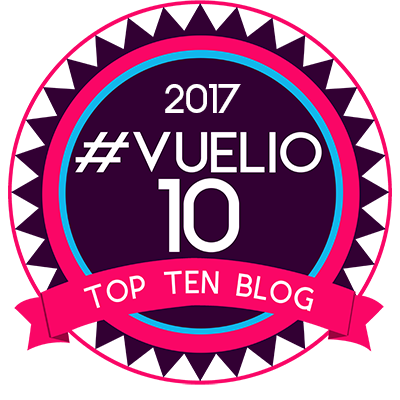 Naturally I am pleased that I have crept up two places to fourth, so I'll need to change my badge as soon as it is available on line. Thanks to everyone who reads my blog, links to it and comments on it. I'm now breathing down the neck of the leaders, but this is a fickle game, so who knows next month? Pete Brown still leads the field - well done Pete - and a surprise entry to me at least is Brew Dog, who have shot straight in at number two.Congratulations to all my fellow bloggers that have done well this month, particularly Woolpack Dave, the Bitten Bullet and Curmudgeon, who have shot up the rankings. Given that beers blogs occupy the vast majority of the top 20, maybe Wikio should rename the category Beer and Wine? Southsea publican, Janice McCormack, plans to call in an exorcist after a ghost apparently kept topping up regular's drinks. The landlady, who runs the pub with husband Patrick, claims spirits are costing her a fortune after the beer-loving ghost continues to give away free beer. She said the poltergeist, nicknamed 'Reedy' after legendary actor and drinker Oliver Reed, has been haunting her pub, the Apsley House in Southsea, Hants, after she took over the pub a decade ago. Umm. Perhaps she'd be better off keeping her eye on the bar, barstaff, Patrick and her regulars methinks. The Hare and Hounds Beer Festival at Holcombe Brook is the biggest pub beer festival in the country and despite needing two buses and a team of native bearers to get me there, I met Tyson for a review of proceedings. I'll tell you about the beers later, but most were excellent and all served by handpump, with sparklers as God intended. After we left the festival we went to Bury to drink some more. Two pubs later, I left slightly the worse for wear, for the 163 bus and home. Tyson was last seen striding to the Metrolink for a tram into town and a pub opening. He is made of much sterner stuff. I fell asleep on the bus, waking with a start in the middle of nowhere. I didn't recognise a thing, so in my befuddled state jumped off at the next stop, only to discover I was on a dodgy council estate and on the right bus route after all, but nearly three miles from home. The buses are one an hour, so I walked. Despite it being bandit country I didn't see a soul. You have to be on blob when drinking with the Beer Hound. Clearly I wasn't man enough for the task.